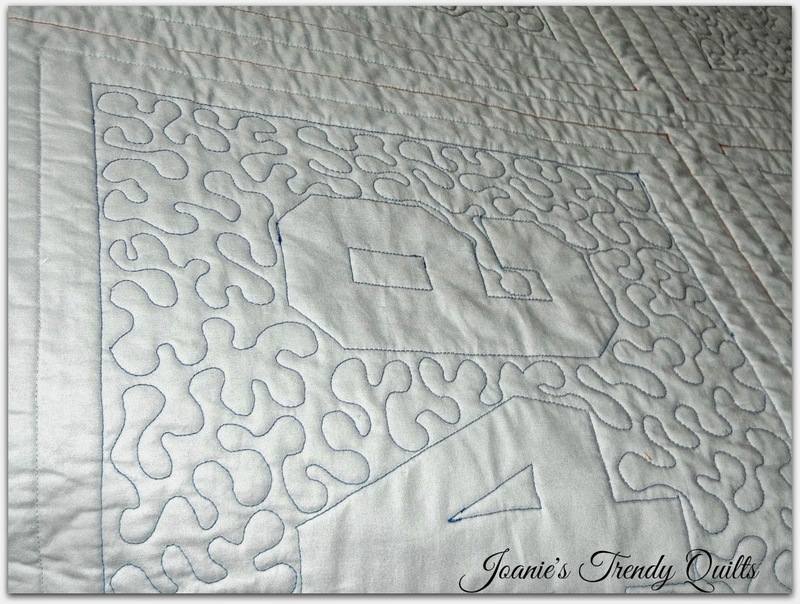 Joanie's Trendy Quilts : Celebrating Another Finish ~ A Real Whopper! This baby is 84" x 105" and weighs 8 lbs! This quilt had to be quilted in 3 sections to manage the sheer weight of it, 2 rows, 1 row and then the last 2 rows. Hefting this quilt around from the ironing board and sewing machine gave me quite a workout. In order to put the binding on I placed a table to the left of me to hold the weight and prevent dragging while stitching. This quilt is for my oldest grandson Tyler. So please allow me to share a bit about him ~ a proud grandma! 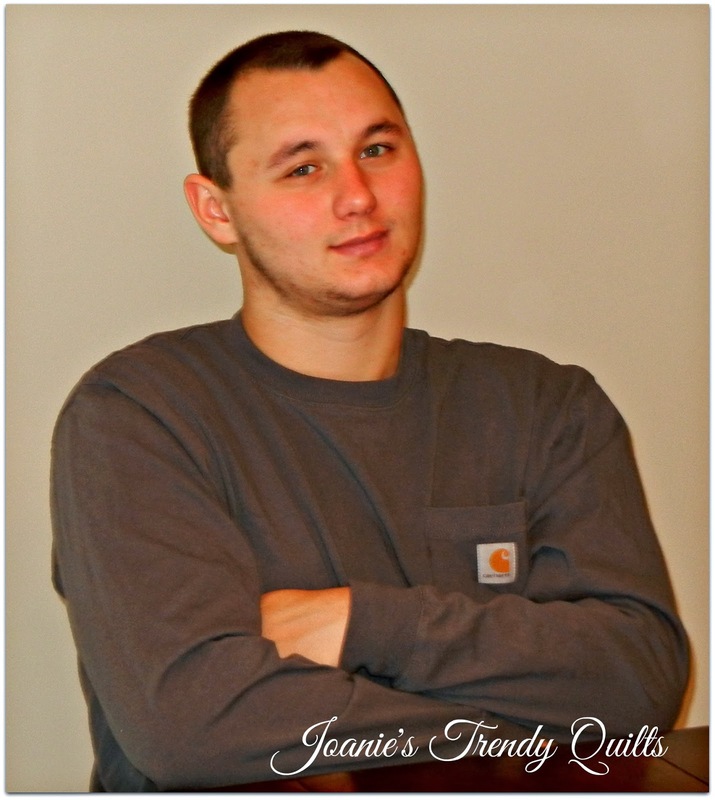 Today Tyler is in his second year of college and is on the Dean's list at East Carolina University. He grew up with baseball beginning in grade school and all throughout middle and high school. 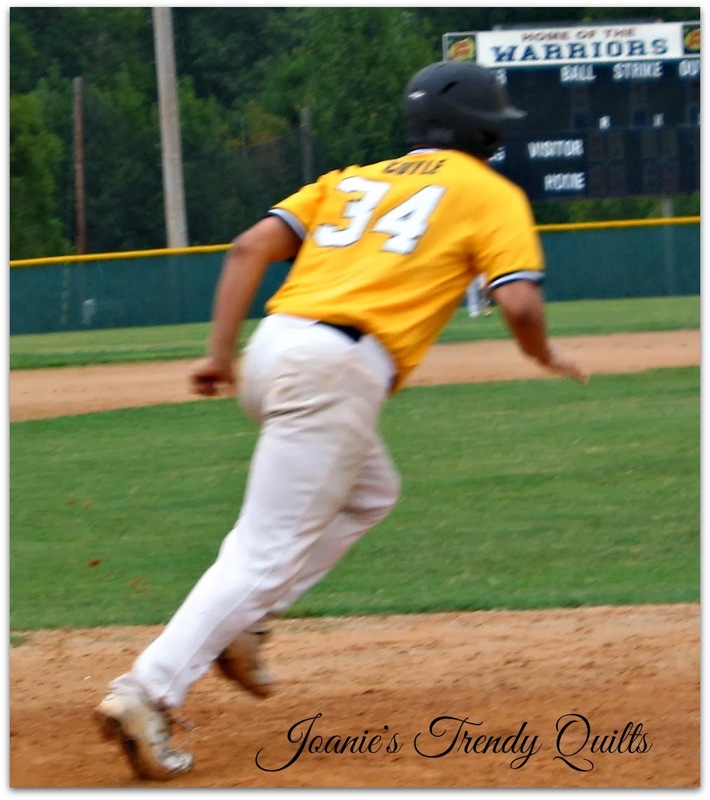 He was on a college showcase team for several years which meant he traveled to various states every weekend during baseball seaon to play ball. Through all this he maintained very high grades in school which I find a bit amazing! He is quiet and soft-spoken and quite respectful! He has 2 brothers which he is very good with most of the time but can be quite a tease! Can't make him out to be too perfect! Each frame which there is 3 of them around each 15" block, has been ditched stitched. The shirts have been quilted with a meandering stitch. I love the shadow boxing on this quilt! Letters and numbers have been stitched around. Each shirt has thread matching the color of the shirt so the back is quite colorful too. The back is gray Kona Cotton. 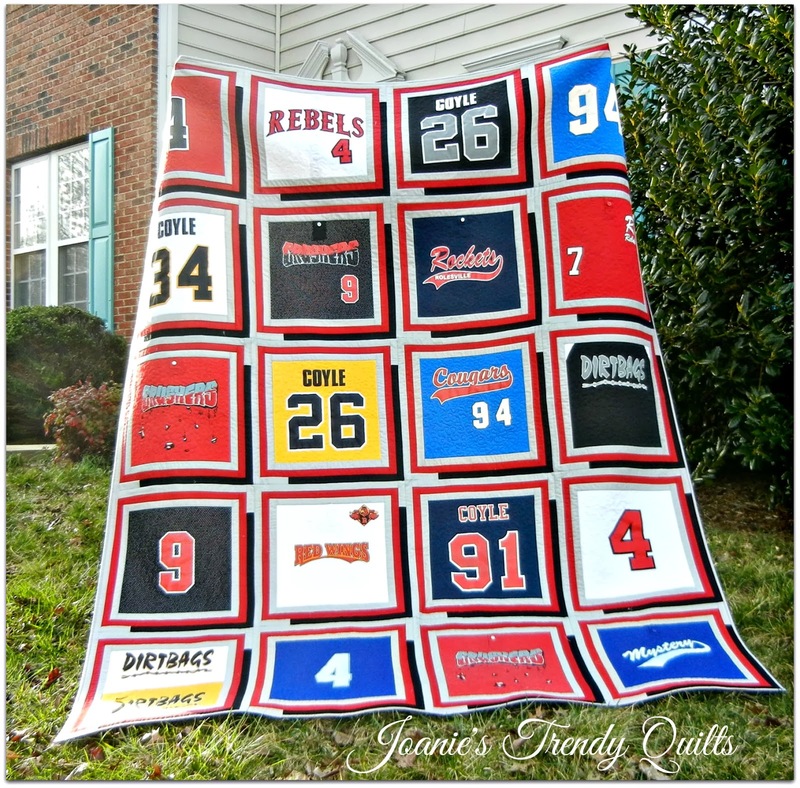 This is Caleb's baseball t-shirt quilt, the first t-shirt quilt I made. I thought it might be fun to see both quilts together. Only one more to to go for my youngest grandson, Parker. 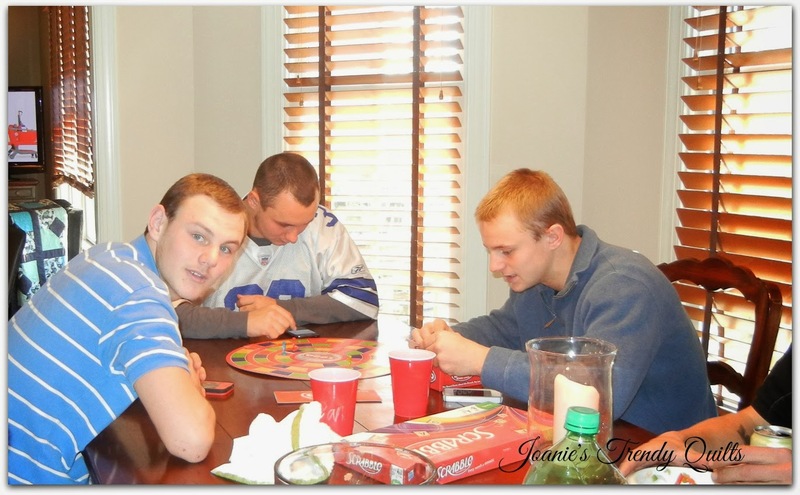 Parker is looking at the camera, Caleb is to the right of him and Tyler is at the end of the table. These are wonderful!! I've been asked to do a couple of these (on a little smaller scale) and have shied away because I don't want to take the chance on ruining someones mementos if I make an "oops"! Any tips for stabilizing the t-shirts? Do you use an iron on interfacing? Amazing quilts, memories for a lifetime. Joanie--I love the black accent color. It adds perspective & is so interesting. Looks like a grandson to be proud of, congratulations! Another great t-shirt quilt! The red frames on your newest one really adds a lot of interest. Beautiful finish! Your quilt is amazing! 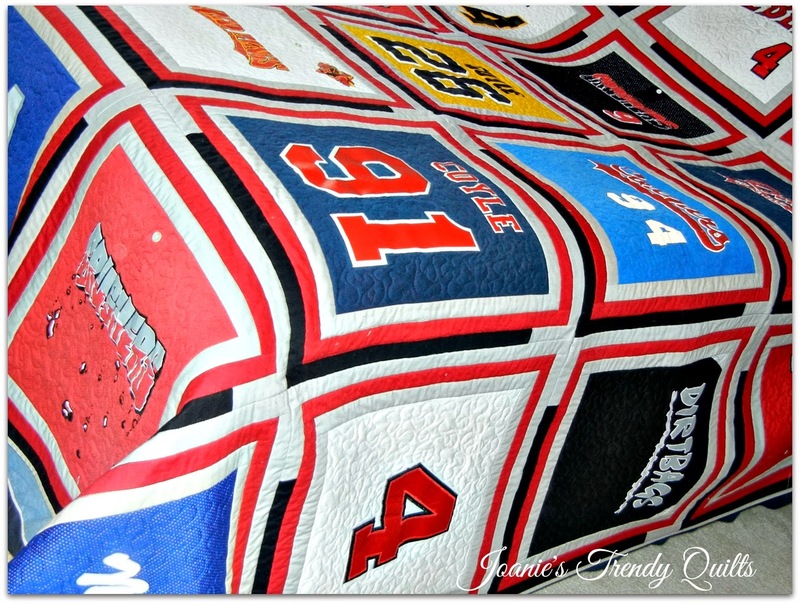 I really like the way you quilted his number into the quilt. It's so nice that you are making these for your grandsons, I'm sure they will treasure them! Love your t-shirt quilts-- the shadows add so much interest and make them unique. These are fantastic! I love the shadow box effect! Tshirt quilts are always so special! Great job with the quilting!! Wow is that huge and heavy!! Every time I see one of these I feel guilty because I haven't even started on my SILs! Thanks for sharing. I love the shadow boxes, too! It really gives the illusion that the shirt blocks are floating. Thanks for showing the backing. Shows off the fabulous quilting! What a great big beautiful finish, Joanie! That is one of the nicest t-shirt quilts I have ever seen. I love the setting and quilting! 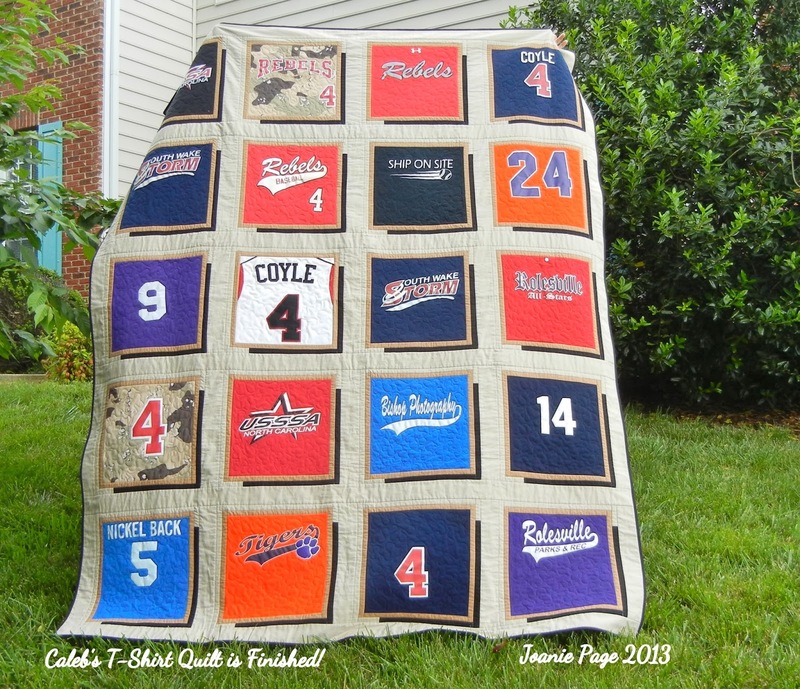 This is definitely the coolest T-shirt quilt I've seen. Thanks for linking up. What a beautiful memento for him! I had to take a double look - my surname is Coyle too! Do you have a NZ branch of your family tree? Thanks for sharing and good luck with the next project! What a wonderful quilt..that I am sure will be loved through many future generations!! I made one of these monsters last spring! Quilted on my Juki - no frame! It's a great quilt! What a special quilt. I am sure he will treasure it!